What are the types of coal? Anthracite: The highest rank of coal. It is a hard, brittle, and black lustrous coal, often referred to as hard coal, containing a high percentage of fixed carbon and a low percentage of volatile matter. Bituminous: Bituminous coal is a middle rank coal between subbituminous and anthracite. Bituminous usually has a high heating (Btu) value and is the most common type of coal used in electricity generation in the United States. Bituminous coal appears shiny and smooth when you first see it, but look closer and you may see it has layers. Subbituminous: Subbituminous coal is black in color and dull (not shiny), and has a higher heating value than lignite. Lignite: Lignite coal, aka brown coal, is the lowest grade coal with the least concentration of carbon. Also, there is peat. Peat is not actually coal, but rather the precursor to coal. Peat is a soft organic material consisting of partly decayed plant and, in some cases, deposited mineral matter. When peat is placed under high pressure and heat, it becomes coal. What is the biggest coal deposit in the United States? Which country has the most coal? The United States has the largest proven coal reserves, with an estimated 260.5 billion short tons of coal in 2008, according to the U.S. Energy Information Administration. 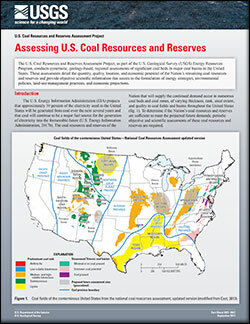 Shaffer, B.N., 2017, Assessing U.S. coal resources and reserves: U.S. Geological Survey Fact Sheet 2017–3067, 6 p., https://doi.org/10.3133/fs20173067. Schweinfurth, Stanley P.; Finkelman, Robert B. Coal--a complex natural resource : an overview of factors affecting coal quality and use in the United States; 2002; CIR; 1143; Schweinfurth, Stanley P.; Finkelman, Robert B. World coal exploration and development; 1983; OFR; 83-741; Wood, Gordon H.
Closeup of Pliocene lignite coal from a Balkan endemic nephropathy (BEN) village in Serbia. Lignite is low rank, or relatively unaltered (soft, or "brown") coal, and is characterized by a brownish color and appearance that often resembles wood. This lignite releases copious amounts of dissolved organic substances into groundwater.